Why are you discounting your price? Discounts are given for two reasons, and if we look deep enough, the two are the same. The first reason is the customer isn’t willing to pay the price you’re asking, because you haven’t shown enough value as to why the investment makes sense. The second reason is the salesperson doesn’t have enough confidence in themselves and the outcome they can provide to the customer. Look at those two reasons and you’ll see it comes down to one thing: The level of confidence you have and how competent you are in communicating with the customer. Discounting a sale is an indication of the salesperson not fully understanding the needs of the customer and not being able to articulate the outcome the customer will receive. The argument you might be thinking is if we just cut the price we’ll sell more and thus make more. This is bogus! When we cut our price, we’re not altering our cost of goods and we’re not reducing the costs we’ll incur servicing the customer. What a reduction in price really means is that profit will be cut significantly. That’s what winds up being the offset to the reduced price. Full price is not something to run from. It’s something to run with, because it requires you to fully understand the customer which in the end is your goal. Remember, the goal in sales is to help the customer see and achieve what they didn’t think was possible. Be sure to not only watch the video, but also check out www.Quotable.com. 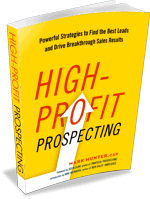 It’s full of valuable insights to help you sell and lead more effectively. I’m pleased to be a regular contributor, along with other influential thought leaders.